WASHINGTON, D.C. – Cadillac will use the auto industry’s most comprehensive and advanced mixed-material manufacturing techniques to build its all-new CT6 top-of-range sedan, allowing creation of a top-of-range large luxury sedan with the agility and efficiency of a smaller vehicle. The CT6, which goes on sale in the fourth quarter of 2015, will be built at the Detroit-Hamtramck Assembly plant, using a unique combination of joining techniques, a first for any General Motors’ model. 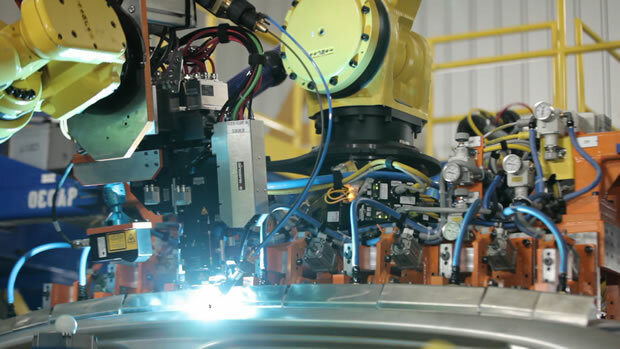 A new body shop with new tooling and advanced technologies – including 205 robots – has been added to the plant. The fully automated, roughly 138,000-square-foot shop is dedicated to the manufacturing of the high-end luxury sedan. When it launches, the CT6 will expand the Cadillac range upwards – adding rather than replacing a current product. Positioned above today’s CTS and XTS product lines, the CT6 aims to join the elite group of top-class large luxury cars. “For the Cadillac CT6 we have developed additional new body construction techniques and technologies allowing various types of advanced and lightweight materials to be combined within the manufacturing environment like never before,” Cadillac President Johan de Nysschen said today at the Washington Auto Show. Engineers faced a new challenge in manufacturing the advanced mixed material vehicle structure for the CT6. Combining different types of joining methods, the team overcame previous manufacturing difficulties involving the joining of traditionally dissimilar materials, while still allowing the engineering team to optimize every panel for its desired purpose. Aluminum arc welding and structural adhesive are also separately used for CT6 body assembly. Among the five techniques, the CT6’s engineers were able to select the best joining method depending on material combination and body location (for machine equipment access). To weld both the inner and outer vehicle frames, 28 robots descend on the vehicle body in two separate framing stations, joining the body-in-white together from all angles. The robots are mounted above and beside the vehicle and can also reach beneath it. The two framing processes were choreographed to compensate for different microscopic vibrations, and CT6 body construction resembles an orchestra as the robotic arms move in and out around the vehicle. “The result is a top-level large luxury sedan, with class-leading body stiffness that generates excellent driving characteristics and impressive fuel economy without compromises to safety, comfort or quality,” he said. Once the body construction is complete, a large robotic arm lifts the entire vehicle from one part of the assembly line to an upper-level conveyer – unheard of for a vehicle the size of CT6 – to be transferred across the Detroit-Hamtramck plant. Using these advanced manufacturing techniques allows for the CT6 to meet the highest standards in vehicle build quality, and to allow Cadillac to use the most mass-efficient materials while reducing fuel consumption and enhancing safety and driving dynamics. The CT6 marks the return of a full-size luxury sedan to Detroit-Hamtramck. The plant also builds the Cadillac ELR electrified luxury coupe, among other products.